No better room to wake up! I took this picture at 6: 47 am, last Sunday, at Uricao Beach, near Choroní Town, Aragua, Venezuela, where I went, with my wife, for a camping weekend as we like to do. Nobody else in the beach, and no complaints about dawn ! See more Room Weekly Challenge submitions here. 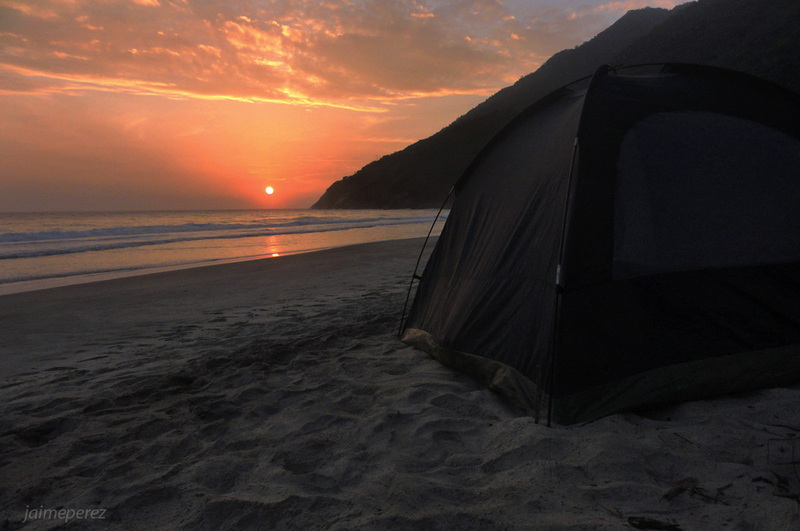 This entry was posted in Color, Weekly PhotoChallenge and tagged beach, camping, Choroní, dawn, nature, solitude, tent, Uricao, Venezuela, wake up, weekend, weekly photo challenge: romm. Bookmark the permalink. Wow, just gorgeous!!!! What a wonderful room! Definitely wonderful; the simplest way to go enjoying and admiring the most gorgeous places and moments! Thanks for your kind words Nicole, I’m glad you’ve stopped by and liked it! Thank you Tina, very kind of you stopping by and commenting! Wow, Jaime, what a fantastic photo and a superb entry for the challenge! I’m not a camper, but with a “room” like this, I may just be persuaded to find a beach somewhere and try it 😉 Well done! Thank you Stacy. You must try; spending a night with the better company you can have, far away from any urban stuf, and wake up with the sound of the waves, in a solitary beach… believe me, is priceless!